Shibily Paulson belongs to St.Mary’s Church Thellakom. Her family consists of her husband and 3 children. Her husband Paulson is a casual laborer. Children are studying. They are the members of Balavedy. They are very co operative in parish activities. They have 4 cents of land. Their house is made with wood pieces and tarpoline. It is difficult to live with 3 children. They can’t built a new house alone. They are asking our help for a new house. Roy is the head of the family. He is the parishioner of St. Joseph’s Church Chengalam. He is doing casual labour. His family consists of his wife and 2 children. His wife works as housemaid in nearby houses. She is also a sugar patient. His elder son Robin is having learning disability . The second son Richu is a 1st standard student. He has 8 cents of land. His house is very old and in damaged stage. Now it is very difficult to live. He can’t make a good house alone. He is asking for our help to build a good house. Mini is the head of the family. She belongs to St. Mary’s Church, Nattasserry in Vijayapuram Diocese. Her family consists of her 2 children and herself. They are living many years in a rented house. Her husband Joshy 43 years old was demised last may 16th due to Brain Tumor.They can’t go ahead in the absence of Joshy. Her son is in +1 and daughter is in 8th standard. They haven’t their own land or house till now. But now they bought 4 cents of land with the help of some good minded people. 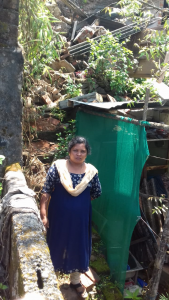 In the present condition she will not be able to build a house. After getting 4 cents of land she is looking for help from some benevolent persons to build a house.Mini is doing stitching for daily wages in a shop for earning bread for the family . She is asking help to build a house through VSSS. Pradeep Thomas is the parishner of Little Flower Church Ranny. He is the head of the family. His family consists of his wife, his 2 children and his mother. He is a casual labor but not in regular job. His elder son is in 2nd standard and youngest son is in Lower Kinder Garden[LKG]. Their cooperation in the parish activities is very positive. They are very poor . His mother is old and sick. The house they are living is in very sympathetic stage. It is like a shed. The roof was broken, it will leak in the rain. 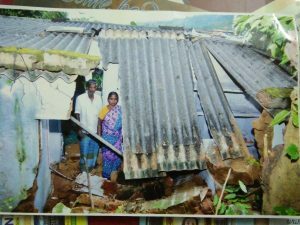 Most parts of the house was collapsed due to monsoon. They are afraid to live in while heavy rain and wind comes. Extra ordinary climate will affect this house. If so, most probably it will fall down. He has 7 cents of land as his own. 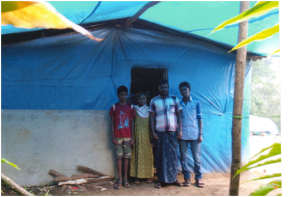 He is asking for our help to build a new house. Chandrabose is the head of the family. He belongs to St. Anne’s Church Pallivasal, Diocese of Vijayapuram. He was a tea estate laborer and retired from job and is sick . Now his wife Mrs. Elizabeth is earning for the family and she will be retired soon. Being estate laborer they have to go out of the house (pany lines), when they get retirement. 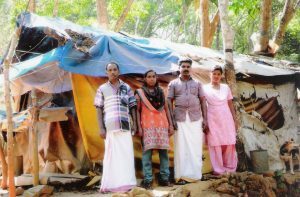 In the present condition this very poor family will not be able to construct a house for them by themselves,when they get retirement. They have own land, 5 cent with proper documents. So it will be great help for them if we support to build a house. If they get financial support parish will try to support in the construction with labour. Mr. Joseph Samuel belongs to St. Mary’s Church Marayoor. His family consists of wife , 2 children and old parents. He is a casual labor His wife is a house wife. His son Christu Raja is completed +2. He has no job. 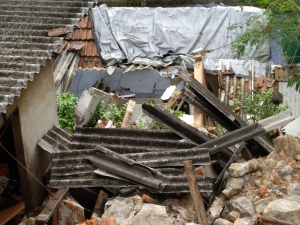 His daughter 21 year is married.They had a house of their own and it was in a poor condition.But this could not survive the heavy rain that took place in August. The house got damaged totally and they became homeless. For him it is impossible to reconstruct a new house by himself. He is looking forward for the assistance from some generous people. 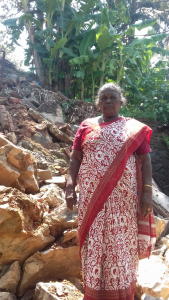 Here is another sad story of a widow who lost her house during this flood. Her name is Lakshmi 45 years old, sick, and she gave her one kidney to her husband who was a kidney patient. Even then he died ten years back. She has 3 children and 5 cents of land. She is not able to go for any work. 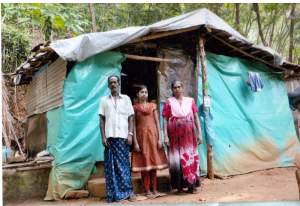 Only income of this family is the small earning of her elder son Mukesh 26 years old. He is working in the municipality. 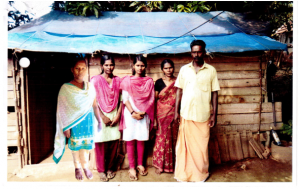 Her second daughter Sudhi is 25 years old with no job. She just finished her study. Last one is Sujithkumar, who is 22 years old. He is a degree student. They are not able to reconstruct their house by their own. She asks our help to build a house. In the picture to the right you can see two houses collapsed during the flood. A huge wall more than 12 feet high fell onto these houses. The two families were Baiju and Pennamma. See their stories below. 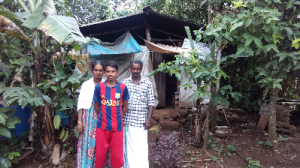 Baiju is the father of this house, 43 years old and a head load worker. Anu is the wife and is 35 years old. 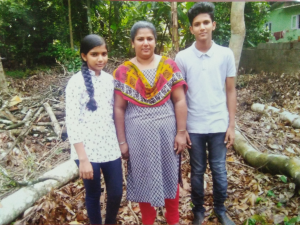 Abin Baiju is the son and is 13 years old and is a VIII standard student. Athullya is the daughter and is 11 years old and is a VI standard student. They are also very poor. They have one and a half cent of land. They don't have any place to live in. They seek our help to re construct the house. Pennamma is 65 years old and sick. She is very poor. Only income for her is the small amount of widow pension. She has one and a half cent of land. 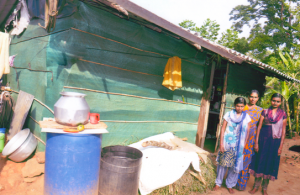 Her house was a bed room, toilet and a kitchen. Remaining part is the kitchen. Whole bed room is under these stones. By God's Grace she was not there when it collapsed. She asks our help to build a house. Raju, 58 yrs old is a parishioner of SH Church, Amayannoor of Diocese of Vijayapuram. He is the head of four member family with wife a son and a daughter. He is a casual laborer and the only bread winner of the family. 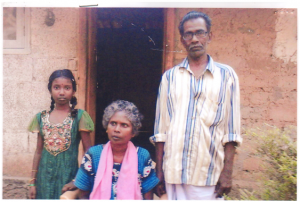 His wife Jaisamma is a chronic patient suffering from liver associated disorders. Both the children are pursuing education. 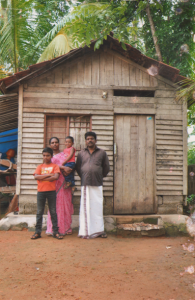 This family had a small house to live in. In the middle of last month the house they had collapsed due to heavy rain and strong wind. All of a sudden the family became homeless. Mr. Raju is incapable of constructing a home by him. He has approached us seeking help. It is a genuine case and deserves support. Jose Antony age of 42 is the head of the family. He is the only breadwinner of his house. His wife is a house wife. Jose Antony is a coolly. Children's study expenses and house hold expenses are maintained only by his income. So, till now he couldn’t make a house. He is not able to build a house on his own. Financially they are very poor. Albert is the head of the family. He is a casual Laborer. His wife Sheeja is a house wife. Daughter Albeena is a 9th standard student. Albin is studying in 5th standard. Albert can’t go for job regularly because of the injury of spinal chord. They have 3 cents of land and living in a small hut. He has a great desire to make a house as his own. He is asking for a house. Let us join together to help this family . Wish you all the blessings of lent. Thank you. Mr.Reji is 36 years old. Living with his wife and two kids. He is a coolie and the whole family depends on this only source of low income from Reji for their daily bread. He is living in a small tent. They have 2 cents of land. 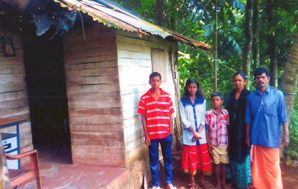 This poor family is asking our help to build a small house. Let us join our hands for Jesus. Thank you. Thomas [Monachan] is the head of the family. He is a casual laborer. His family consists of his wife and 2 small children. His father is a cancer patient. A part of his income needs is for the treatment of his father. Thomas' family is living in a small shed. He has 3 cents of land. The shed is not good for living. Their life situation is so poor. Thomas can’t make a house alone. He needs help from others. He is asking us for a house. Alexander is the head of the family. His family consists of his wife Annamma and daughter Aleena. Annamma is a house wife. Their daughter Aleena is studying in 9th class. Alexander met with Stroke, and he has Kidney problem, diabetics & heart block. He is unable to do any work. He needs much amount for medicine every month. Their life situation is very poor. Their 5 cents of land was given by VSSS 25 years ago. Their house was in a dilapidated condition. 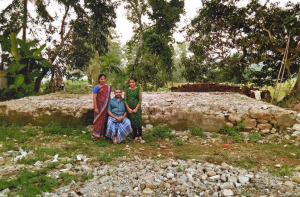 During last monsoon the area was flooded and water entered into their house and it fell down. Now, therefore, they are urgently in need of a house. Mathai is the head of the family. His family consists of his wife and a daughter. He is the bread winner of the family. His wife Annamma [Selin] is a mental patient . Once she was paralyzed . Now she is getting better. But she needs the care and help of someone always. So Mathai can’t go for the job. One Religious congregation, relatives and neighbors are helping them for the day to day needs. He owns 5 ½ cents of land. 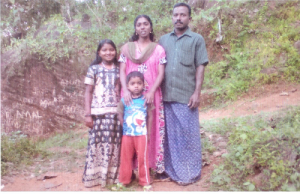 Their daughter Elizabeth Mathai [ Mahima ] is studying in 6’th standard. Their house is made of mud. This family is in pathetic situation. 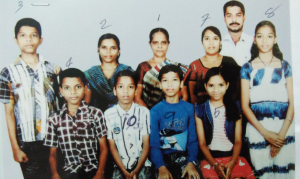 This family consists of Father, Mother and 3 children. Sebastian is the head of this family. His wife Beena is a heart patient . Because of a Heart block she did Angioplast . His daughter Reshma is assisting in an office. Second daughter Reshmi is a student of Dental technic. Third daughter Preethy is a BCOM student. His mother Thresiamma is also living with them. He has 4 cents of land. They are living in shed. He is a cooly .This is the only income of this family. He is struggling to meet the heavy expenses of children's study etc. They are actively participating in the parish. They are asking our help to have a house. Brigith Ansal is the head of this big family having 10 members. She is a widow, her husband died 9 years back. She had two children. The elder son David died due to jaundice 4 months back. His wife Sandya is now a widow. They have 3 children. All are studying at our Holy Family School at Kottayam. Godwin is in 11th class, Godson is in 10th class and Deveena is in 8th class. The younger son Sunil met with an accident and his leg has got 2 cracks. He is undergoing treatment. His wife Maria is a house wife. They have 3 children. Salva is in 9th class, Frizo is in 8th class and Ferin is in 7th class. They are also studying in our school. They all are living in a rented house. They don’t own land or house. For the treatment and education of the children they are facing financial difficulty. They are also in great need of their own house. They have to pay Rs.6000 (93 US Dollars) per month as house rent alone. Mr. Kunjumon is a member of Infant Jesus Church. He is day laborer (Helper in construction works). This family actively participates in all the activities of the parish and his eldest son, Albin, is a 5th year seminarian. The house in which he and his family lived collapsed in the summer rain of May and now living in a temporary shed. He is in a dire need of a house. Members of Peoples Development Committee and parish have promised all possible things for the speedy construction of the house. 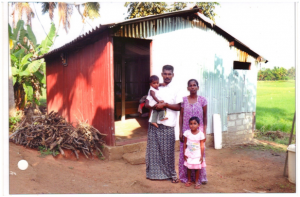 Mr. Kunjumon and his wife together own 20 cents of land. Mr. Paul Joseph owns 10 cents of land and had a very old house. 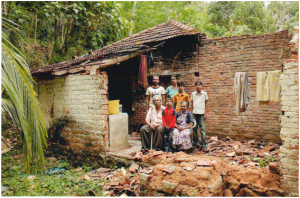 Some months back that old house crumbled down and the entire family moved to a makeshift house (Shown in the photograph). He has found it very difficult to construct a house by his own. So he is seeking the help of some benevolent people to materialize his dream and provide a secure shelter for his family. Here is a request from Joseph aged 79 years from the parish Nattakam. Joseph has his 72 year old wife, daughter and her family, all together 7 members living in an old house in collapsing condition. They have 4.5 cents of land. Johnson is the only earning member. They are not able to find money for themselves to build a house. They beg our help to build a house. 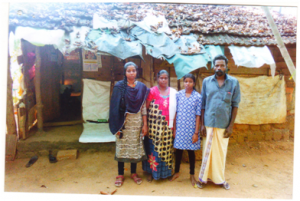 P.A.Varghese and his family are very poor and consist of two daughters and the parents. They have 11 cents of land. The hut (cannot be called even as a hut) where they have lived for years is in very pathetic condition. They are not in a stage to earn some money to build a house. P.A.Varghese is the father of this house. He is doing casual labor, even that he only gets now and then, and it is the only income for this family. His wife Reji is a mental patient. Salu their daughter is 19 years old and studying for nursing (She is not in the photo because she is staying in the hostel). Sandra the younger daughter is 13 years old and a student in the standard VIII. P.A.Varghese has to spent a great amount for his wife’s treatment too. They are hoping for a house through “We Share”. Mr. Jaymon(43 Yrs. ), Puthuchira (H), Kumarakom P O belongs to St. Peter’s Church, Kumarakom of diocese of Vijayapuram. His family has six members. They are his wife Lissy (40Yrs.) his daughters Joel (8 Yrs.) and Jewel (2 Yrs. ), sister Jancy (40 Yrs.) and mother Annamma (64yrs,) a widow. The only bread earner in the family is Mr. Jaymon. He is a casual laborer. His wife is looking after the house hold affairs. Both his mother and sister are dependants of Mr. Jaymon. His 40 year old sister Jancy is deaf and dumb and is unmarried. His elder daughter is in primary class and the younger one has mental retardation. 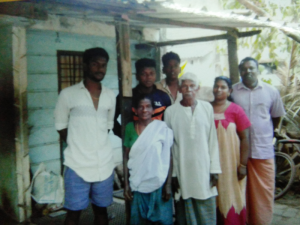 In spite of all difficulties in life Mr. Jaymon is an active member in the church and a member in one of the Self Help groups run by Vijayapuram Social Service Society. Mr. Jaymon has a very small plot of land (2 ½ cents) with a house shown in the photograph. This house is very old and in dilapidated state. It is beyond repair. 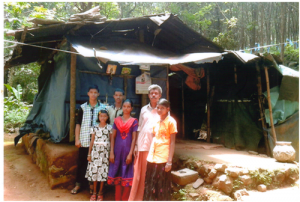 This family’s great aspiration is to build a new house which would give them a sense of belonging and better shelter. The People’s Development Committee functioning in the parish made a thorough investigation about Mr. Jaymon’s case and gave a report that the case is the most deserving one and needs consideration. Mr. AneeshKumar is a member of Mt. Carmel Church. His family actively participates in all the programs of the parish and the diocese. 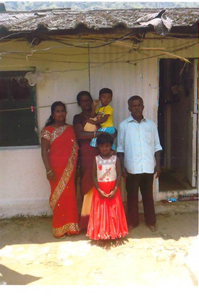 His wife, Mini Aneesh, conducts a study center run by Vijayapuram Social Service Society in the rented house they have. Mr. Aneeshkumar has two children. The elder one a girl, Aleena (9yrs. ), is studying in fifth standard. The younger one Albin (5yrs.) is a nursery student. He suffers from clotting of blood in brain and gets fits occasionally. For the last three years he is under treatment. 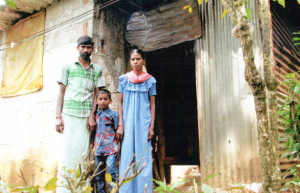 Mr. Aneeshkumar is a casual (day) laborer who lives in a rented house with his family. 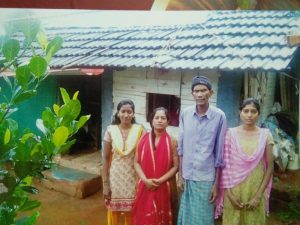 This family owns a small plot of Land (5 ½ cents) The house they use now has only one room and a kitchen. They have a great desire to build a house in their own plot. But the financial stringency is not allowing them to make a move towards the construction of the house. Moreover Mr. Aneeshkumar recently succumbed to dengue fever and cannot go for work continuously due to aches in all joints. Villona is a Cooli worker. He belongs to Nedumkandam Kallar parish at high ranges. He doesn’t have a proper house. He has seven cents of land, at present he is living in a hut. His wife is taking treatment for Arthritis for long years. She needs other’s help even to walk. Their Son Sebastian Akash is studying. The long years of continuous treatment of his wife and at present the study of his son etc. are difficult task for him to bring up the family. When she is severely sick he is not able to go for work. 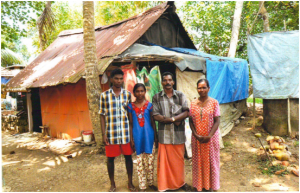 All are happy to have rain but during the rainy season he is frightened because of the leaking roof, sickly wife and his son are the concern for him. If we are able to give a house for Villona &family they will be so happy and grateful. Mr. Raju Devasia's (44yrs),family is composed of five members. His wife, Jiji (42yrs.) is looking after household affairs. Their three children are Albin (9yrs. ), Ashish (8yrs.) and Anton (3yrs.). The youngest child is a heart patient and is convalescing from recently carried out heart surgery. 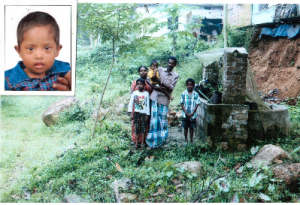 A substantial portion of Mr. Raju’s income goes for the treatment of this child. Mr. Raju Devasia is a casual (day) laborer and has a small plot of land . But he has no house of his own. At present his family lives in an extended portion of a relative’s house and pays rent for it. 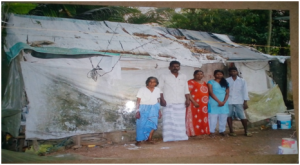 Mr. Raju’s wife is a member of Self Help Group run by Vijayapuram Social Service Society and Raju is a member of People’s Development Committee in the parish. 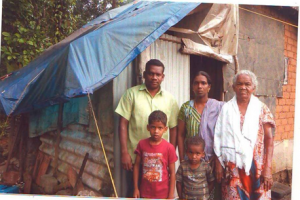 Let us work together for Raju's house during this Advent. Thank you. Mr. Mathew George is aged 47 yrs. He is married and has two daughters. Mr. Mathew married a girl from an orphanage some twenty two years back and has a daughter and he adopted another daughter. These two girls are now past their teenage and pursuing their post higher secondary education. At present Mr. Mathew is a cancer patient and cannot do any labor. The family is sustained with meager income which his wife gets from casual labor. Because of his present critical condition Mr. Mathew is taken as an patient of Palliative Care Unit of St. Joseph Convent and looked after. 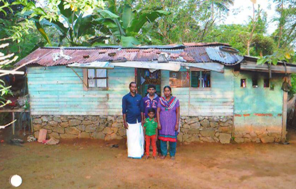 Mr. Mathew owns a small plot (2 cents ) in which there is house – better to term it as a hut. It is a shanty and is in a collapsing state. They get protection from sun and rain with additional protection of tarpaulin spread over the roof. They are not in state to construct a new house by themselves. If they are included in We Share, it would be a great help for them. Lizzy Joy is a widow. Her Husband died of cancer some years back. Even though she is sick she is going to work on some days to nearby houses to earn her lively hood. Her three children are studying. Youngest son aged 14 is a mentally retarded boy. She has also to look after her aged mother. She owns 13 cents of land but no house. 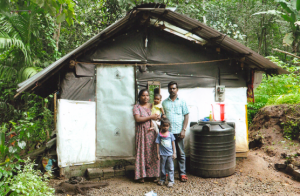 This family is now living in a small dirty damaged hut. 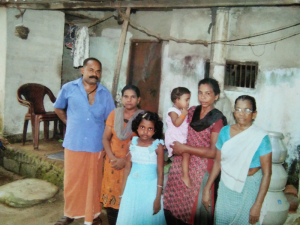 Alphonsa George is a widow, she is having two girl children and one among them is taking treatment for Respiratory irregularities and mild mental retardation. Second one is studying for degree. She is having only three cent of land. At present they are staying in a hut. Sibi is working as a driver for daily wages. He is the head of the family. His family consists of his wife and his two children. His son Sebin is studying in first standard and his daughter is only 2 years old. 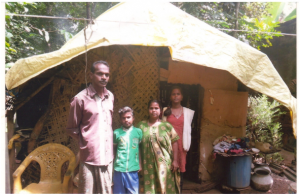 The income that he gets is not enough to manage his family and to build a house. He has 5 cents of land. They are living in a shed that which cannot be called as a house. Antony K.J is the head of the family and is the only bread winner of the family. He is a carpenter. He has no regular work he works as coolie. His family is consists of his wife and his two children. His children are studying. He has 11 cents of land. Augustin Antony is a casual laborer. His family is consists of his wife and his two sons. His children are studying, first one is studying for +1 and second one is in 10th standard. With his own effort he has bought ten cents of land in high range area. 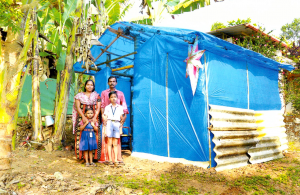 They live in a shed which is covered with plastic sheet since he cannot build a house by his own effort. Thomas is the head of the family and he is a casual laborer. His family consists of his wife, two daughters and two sons. His children are studying. First one is mentally challenged and studying in a special school, the second one is in 7th standard, the third one is in 8th and the fourth one is in 6th standard. He has 3 cents of land. They live in the shed which cannot be called a house. His wife is suffering from some uterus problems. James is the head of the family. He is sick since he had a stroke. His wife is suffering from hypertension. His son Sony is the only bread winner of the family and he is working as a home aide. His wife Sheeba is under treatment for the psychological problem. His children are studying . The first one is in 8th standard, second one is in 7th standard and third one is in 3rd standard. They have 10 cents of land. 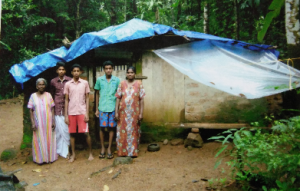 Their house is destroyed from the monsoon. Joseph is coolie laborer and the only bread winner of the family. His family consists of his wife and two children. His wife looks after the house hold work and his children are studying. His son is studying for +2 and his daughter is studying in 7th standard. He has 3 cents of land. Jomon is the parishioner of Little flower church Elikulam. He is an Auto Rickshaw driver.He has a father,sister and his wife.Mother has diedbycancer. Father Mr Joy is a daily wage worker and sister Meenu is studying computer. His wife Manju is a house wife. 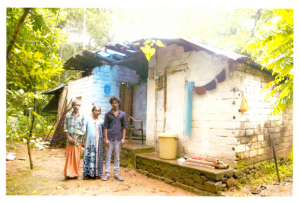 He has only 3 cent of land and has a small house which can not be called as house. It is made by tarpoline and some other materials. 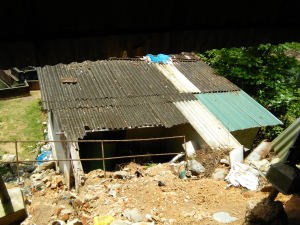 The house condition is bad and doesn’t have any facilities. They have a well but they lack toilet facility and electricity. So they need help for building a home.